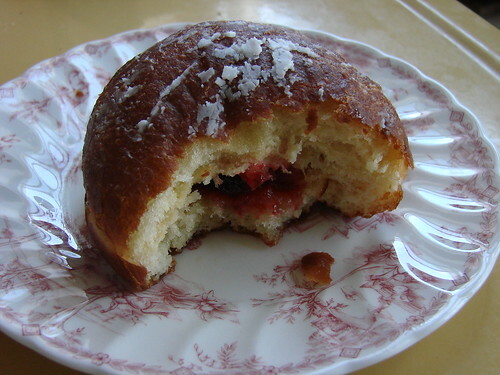 Like their neighbor Almondine, Colson also makes raspberry jam stuffed doughnuts. Quantities are extremely limited--the guy behind the counter told me that they only make 10 to 12 doughnuts. Soft and tender these doughnuts didn't have quite as much filling as the ones at Almondine and Lawman felt were a little bit heavier. The dusting of powdered sugar bought a welcome bit of sweetness. While I don't know that these doughnuts will eclipse the brioche suisses, there's nothing like a fresh doughnut on a Sunday morning. I've been craving Colson all weekend! I spent Friday night discussing morning buns (or morning rolls, whatever you want to call them) so another visit is definitely in order. That is one insane looking doughnut - but with a limit of 12 a day?! I'm never getting my hands on one. @the [sugar] apothecary: yeah, you have to get up pretty early in the morning to get one of these! @BigAppleNosh: thanks! I can't resist a good doughnut! Save the Essex Street Market! Chicken & Waffles for Lunch!! Hot Cross Buns, Hot Cross Buns!